There is no question about it, business owners and entrepreneurs for companies big or small have a lot on their plate. One of the biggest challenges they face is advertising and marketing their brand. In today’s world, digital marketing is booming. The influx of social media over the past decade is skyrocketing, allowing companies to reach customers across the nation, and even across the world. While digital marketing is a significant tool to running a successful business, it is not the only way to establish your presences and make your company known. A good-ol’ fashioned sign to advertise your business is extremely effective to attract customers. Signs By Van has been in business for over 30 years, and it’s safe to say that we know a thing or two about creating eye-catching signs to help market small businesses. Size Matters: We’ll say it bluntly—a small sign is not going to get noticed. The next time you’re driving down the road, take note of the signs that are visible and their size. Roadside signs are challenging—yet incredibly beneficial. Drivers pass by businesses quickly and don’t have the chance to read every sign, let alone the ones that aren’t readable. When you work with Signs by Van to create a custom sign for your business, consider the size first before you move onto the creative aspects. Once you have determined the size of the sign, you need to select the size of the lettering. Now that people driving by have noticed the big sign, they need to be able to read what it says. Or else, what’s the point? Creative Colors: There is a fine line to be aware of when you choose signage colors. As a business owner, you want colors that will be eye-catching, but you don’t want to choose too trendy of colors. The reason being you risk the trendy colors becoming an eyesore, and that’s the last message you want to convey to customers. Unless you plan on creating custom signs for your business every year, then by all means, don’t let us stop you. If you are struggling to choose the right color combination for your business signage, contact Signs by Van. Our sign professionals will help you to design the best custom sign for your business. Keep It Simple: You may elect to include your logo, design features and additional details like, “Established 1988” below your business name—which is perfectly acceptable. However, don’t overdo it on the design elements to the point that passersby and potential customers don’t know what your business is. 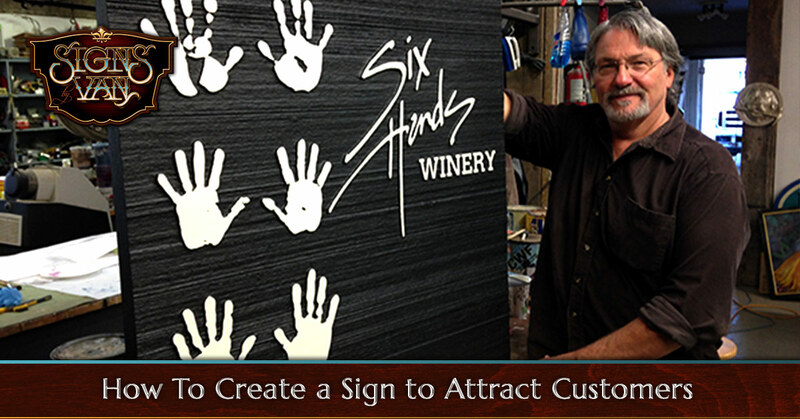 The point of a custom sign is to draw your customers in, not confuse them. Signs by Van is California’s Top Rated Local® sign company and have designed and built thousands of custom signs. Our team of experts has experience building 3D lettering signs with custom colors that is sure to give the public a lasting impression and entice them to want to visit your business. If you’re looking for custom signs for personal use, such as custom wood signs for a wedding, then we’ve got you covered. The artists at Signs by Van are here to help you bring your visions to life through our creative custom signage. Check out our portfolio to see examples of the dimensional signage that we have built over the years for wineries, restaurants, businesses, and more. Contact us here to get your free custom sign consultation today!